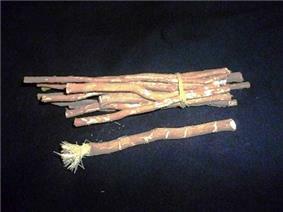 The miswak (miswaak, siwak, sewak, السواك) is a teeth cleaning twig made from the Salvadora persica tree (known as arak in Arabic). 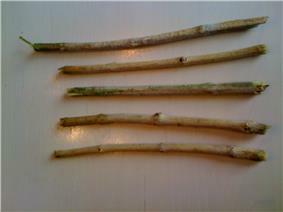 A traditional alternative to the modern toothbrush, it has a long, well-documented history and is reputed for its medicinal benefits. It also features prominently in Islamic hygienical jurisprudence. A 2003 scientific study comparing the use of miswak with ordinary toothbrushes concluded that the results clearly were in favor of the users who had been using the miswak, provided they had been given proper instruction in how to brush using it. However, the study's sample size was only fifteen people, calling into question its statistical significance. 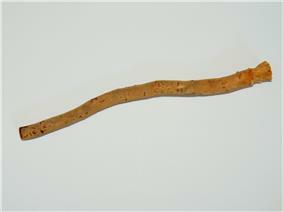 The oral hygiene concluded that further research was needed to document the effect of the miswak. ^ Al-Otaibi M, Al-Harthy M, Soder B, Gustafsson A, Angmar-Mansson B. (2003). "Comparative effect of chewing sticks and toothbrushing on plaque removal and gingival health.". Oral Health Prev Dent 1 (4): 301–7. ^ Almas, K. (August 2002). "The effect of Salvadora persica extract (miswak) and chlorhexidine gluconate on human dentin: a SEM study.". J Contemp Dent Pract. 3 (3): 27–35. ^ a b Almas, K; Skaug, N; Ahmad, I. (February 2005). "An in vitro antimicrobial comparison of miswak extract with commercially available non-alcohol mouthrinses.". Int J Dent Hyg. 3 (1): 18–24.